An incredible getaway starts here. Just 7 minutes from waterfall hikes at Deep Creek, this delightful rental has it all! Relax around the outdoor fireplace and take in the long range views on the breezy porch. Hot Tub or Jetted Bath Tub, take your pick! Less than a mile from Deep Creek, Black Bear Crossing is the perfect base camp for an adventure in the Smoky Mountains. This three bedroom, 2 bath, mountainside cabin is just minutes from hiking, shopping and restaurants in downtown Bryson City, and less than 15 minutes from White-water rafting and Cherokee. This cabin is perfect for motorcycle groups searching for a cabin with paved access to the cabin and large double car garage to store bikes. Black Bear Crossing has plenty of room for the whole family to spread out. The well stocked kitchen for cooking and entertaining. The dining table has comfortable leather chairs, and there are two more chairs at the breakfast bar. With leather recliners and a cozy couch, the living room upstairs is just right for enjoying the gas log fireplace and satellite TV. The Master bedroom is located on the main level and has a king bed, bath with jetted tub and a separate tiled shower, and deck access.The master bathroom has handicap bars. French doors open to the deck, letting in the exquisite view of the sun rising over the Smoky Mountains. The lower level has two separate bedrooms, full bath, and an additional family room with a TV and sleeper sofa. Enjoy the mountain views from all of these rooms. One bedroom has a queen size bed and the other bedroom has two twin beds, which can be converted into a King at your request. Spectacular colors spread across the Smoky Mountains through the day and through the seasons. You can savor these beautiful moments indoors or outdoors at Black Bear Crossing. Rocking chairs make the views even more enjoyable. There is a double car garage available for motorcycle or car use. The cabin was beautiful and clean. Will Probably rent this one again! We loved the fireplace on the large porch, we had plenty of room! Very nice for 3 motorcycles and a trailer. Have been to the area before and it is always nice this time of year. Really enjoyed our stay, great cabin and location. View is magnificent! The experience was great. We received timely email confirmations. We even received a personal call on our arrival date to ensure we had located the cabin with no problems. 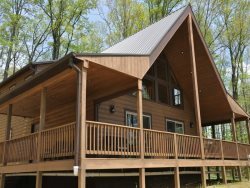 This cabin is the perfect location for a Smoky Mountain family experience. It was like our own cabin. Everything we wanted to visit was fun and close. We can't wait to come back and visit again. Thank you so much for letting us rent your cabin. The cabin was very nice and relaxing. We have decided we will be coming back and probably bring some family or friends. The team was very helpful and willing to come out and take care of the small problems we encountered. My family and I have lived in Shanghai for 10 years. This year your cabin provided us a wonderful opportunity to help them to begin to know nature and to explore Native American culture. We had a great time and beautiful weather. The View!!!!! As beautiful as the cabin is it doesn't hold a candle to the view. We rode motorcycles here from DE & MD to ride The Dragon, Cherohala Sky way and other roads known for their twist and turns and scenic views. The roads were amazing the views stunning and breathtaking but some of our best memories were made gathered on the back deck of this cabin. Thank you for the use of your cabin and the opportunity to make wonderful memories. We absolutely loved our stay! We had some cold weather so the fireplaces were nice to keep us cozy and we loved spending time in the hot tub. I hope we get a chance to come back! We stayed here for a reunion of some old college friends. We loved hiking and being in the mountains as well as relaxing by the fire and in the hot tub. Thank you! Amazing view. Great value. Wonderful stay. This is the perfect cabin for our family. Grandparents with two families and 3 of our grandkids. We went on the POlar Express. Great Time! Loved the details of the cabin.Loved the fireplace, bathroom and kitchen. We can't wait to come back.